Common Council member Fred Visconti pulled a sleeping man out of bed while the man's bedroom burned during a fire this afternoon on Mountainville Avenue. "Talk to Fred Visconti, he's the hero," said J.R. Mitchell, the owner of the house that caught fire at 12:05 p.m. today. Mitchell was not in the house at the time, but his two sons, Rob, 18 and A.J., 21, were in their bedrooms. A.J. said he was listening to music in his first-floor room when he heard the smoke detector alarm. He went upstairs to his brother Rob's room, saw smoke, and yelled for his brother to get out of the house. A,J, ran out of the house to call 911, only to realize his brother was still upstairs. Meanwhile, Visconti, a retired firefighter who lives about three houses away, spotted the smoke while in his backyard. He went to the house and made his way upstairs to Rob, who was still asleep as his bedroom burned around him. "I had to grab him out of bed," said Visconti, his face still smeared with soot. "Once he was up, he realized what was going on and he got out." Rob Mitchell was taken to Danbury Hospital, where he is being treated for smoke inhalation and minor burns, according to fire officials. The second floor of the house suffered extensive fire damage. Deputy Fire Marshal James Johnson is investigating and as of 1:30 p.m. firefighters were still on the scene. Seeing that my blogging comrade Connecticut Bob contributed to this film, here's a shameless cross post plug for the movie Honk for Peace. Since it's the holiday weekend, there will be more non-local related posts on this site. Lets look at some facts on the Republican Presidential nominee, John "Angry" McCain that might surprise you. The zip code is younger than John McCain. Two digits. The country was so damn small that there were only two digits in the postal code. 2. It was a postal inspector who submitted a proposal for an updated system in 1944. Kraft Macaroni and Cheese is younger than John McCain. You see, the directions call for the chef to drain the water after the macaroni has come to a boil… but that’s insane. Between the milk, the butter, and the excess water that didn’t drain, you’ll still be left with a runny mess that will deprive you of the full “cheese” experience. One must do a second, “cleansing” drain just prior to emptying the contents onto ones plate. And one must also use a wooden spoon. For the less industrious among us, there’s a product called “Kraft Easy Mac” which can be prepared with just water and a microwave in 3 1/2 minutes… but that’s just sad. Penicillin is younger than John McCain. In 1942, when John McCain was presumably an unvaccinated 6 year old, John Bumstead and Orvan Hess became the first physicians in the world to successfully treat a patient using Penicillin. At the time, they could not possibly comprehend what this breakthrough would mean for children, soldiers, and Paris Hilton. Scrabble is younger than John McCain. How fortuitous. What might very well be the world’s most boring game is actually younger than might very well be the countries most boring Senator (although there certainly are some quality contenders in that field). The Area Code is younger than John McCain. OK, this is a good one - so good, in fact, that it gets its very own category (”Area Codes”). While the telephone itself was invented a mere 60 years prior to Pa McCain looking at John and saying to Ma McCain “Someday this boy will grow up to not become President!, the area code wasn’t introduced until the 1940’s. I find this fact very confusing because, according to census.gov, the population of the United States in 1940 was 132,122,446. Does this mean that less than 10% of the people had phone numbers because, without an area code, the highest number could only be 999-9999? I’d ask John McCain for clarification but I tend to think that he wouldn’t take my call. The Shopping Cart is younger than John McCain. This seems like something cavemen should have invented (God, I hate those stupid Geico commercials) - I mean, it’s wheels and a bucket. It couldn’t be simpler. So simple, in fact, that one would think that it not only pre-dates John McCain but that it would pre-date his parents and grandparents as well. The Grapes of Wrath is younger than John McCain. I have to admit that I never read the book (1939) and was only turned on to the movie (1940) because of the Springsteen album (The Ghost of Tom Joad) but its message is timeless (I guess that’s part of what makes a classic). In a nutshell, the economy is down the drain, lenders are foreclosing left and right, there are more applicants than there are jobs, and people are in search of a way to return to dignity. Hmm, I wonder if they’ll ever make a sequel? Cheerios are younger than John McCain. I have 18 month old twins at home and, as any parent will tell you, these little, round treasures of toasted whole grain goodness might as well be called “Crack-ios” or “Crystal Meth-ios”. There’s nothing my kids like more than to take a fistfull of these suckers and get (maybe) one or two right in their mouths. I look forward to telling them, come this November, that our country had the good sense to elect a President younger than this ubiquitous brand. And I imagine that they’ll poop in celebration. The Beav, aka Jerry Mathers, is younger than John McCain. Will the 75,000 dollar investment be worth it? Will there really be over 5,000 people attending the films? Will the festival bring in the projected revenue for the area as promised? Since word that the Common Council was prepared to fork over 75,000 to the organizers of the Connecticut Film Festival, I thought it would be important to keep a CLOSE eye on the success of the event. You see, I have a problem what the media in our area. If you look at the list of organizations sponsoring the festival, you'll notice such media outlets as The News-Times, Fairfield County Weekly, and Tribuna. Now, with that being the case, it's logical to assume that they won't do much in terms of monitoring the success of the festival when it comes to holding the organizers accountable for the promises they gave to the city (i.e., revenue the festival would bring into the city, numbers of people attending the event, etc). FOR INSTANCE, watch this report on the festival from FOX-61. Okay, with that in mind and remembering that the city was told that this event would people in aprox. 5,000 over the course of the entire event, which would result in people eating, drinking, and partying downtown (a.k.a. spend money in downtown businesses), take a look at MY footage from opening night. Make sure to check the footage of all the restaurants on Ives, White, and Main Street. NOTE: The footage of downtown businesses was shot at various times from 8 pm until 11:30 pm. Get the point (and to note: a good portion of people who were at the Palace that night were affiliated with City Hall, or the event in some capacity). It's almost like the two videos were shot in different cities. Mind you, this was opening night...a night that would probably attract the largest number of people to a screening. Again, was the 75,000 dollars the city put into this festival a good investment? We'll soon find out as I'm just getting started. In light of his endorsement of Barack Obama for President, earlier today I conducted a interview with Congressman Joe Courtney where we talked about his decision to back Obama over Hillary Clinton. We also touched on other subjects such as his support for the new G.I. Bill (which the President has threatened to veto) and his thoughts on being a first term congressman for the second congressional district. You can hear the full interview right now over at My Left Nutmeg. Since highlighting the xenophobia in Danbury and such idiotic notables as Tom "Big T" Bennett, John McGowan, Joel Urice, and Pauline Basso, many organizations around the country have taken interest in the misinformation that being peddled by those who HATE immigrants in our area. Media Matters for America is one of those groups and today, they launched a new site dedicated to the misinformation on immigration that's spread on cable news shows. Too bad they don't cover the nonsense that spread on the local access shows in our area as it mirrors the crap on these national shows. May 19th marked the one year anniversary of the symbol of irresponsible development, the opening of the god-awful Elmer's Diner. In honor of this moment, I'll be doing a series of posts on the history of this development, including the laughable excuses and lack of concern from the mayor, boneheaded comments from owner Elmer Palma, and the number of issues with this place that, after ONE YEAR of complaints, has not been addressed by the city. Lets start things by going back in time and reading my first report on this idiotic diner back on May 24th 2007. Why is the City of Danbury allowing this dangerous parking on a busy road to take place? Why aren't there any NO PARKING SIGNS in front of the diner? Isn't this just a disaster just waiting to happen? While I was working on a full background post on Elmer's Diner scandal, since the News-Times did such a poor job with their story on the Diner nightmare, I felt compelled to start rolling on my footage. If EVERYONE in the city knew that Elmer's Diner would be a traffic nightmare, why did City Hall drop the ball? The situation is quite simple and everyone knew the drill...with the limited parking space at the location, the high traffic conditions on Padanaram Road (one of the busiest streets in Danbury) and the grumblings from the public since the start of the diner's foundation, EVERYONE who travel the roads in Danbury daily were fully aware about the serious traffic problems the opening of Elmer's Diner would create (including a mayor who lives in that general area and has had an earful from the public for months). Given this fact, one has to wonder why is it that the traffic conditions at the diner's highly congested location were not addressed? Elmer's Diner consist of 22 parking spaces for a place that seats 88 people. Again...the diner ONLY has 22 parking spaces for 88 people. Now, based on that fact alone, you know you're going to run into some problems. Oh, lets not leave out the fact that there is no stop light present, no crosswalk, and it's only a two lane street. Since the parking is limited and the parking area is extremely tight, customers are opting to do either one of two dangerous things: park on the shoulder of Padanaram Road, (people opening their car doors while not parking properly off the shoulder and are too far into the road, customers leaving the diner AND MAKING AN ILLEGAL U-TURN IN TRAFFIC, customers leaving the parking lot are limited in the amount of traffic they can due to the cars parked an the road). WHAT'S EVEN MORE DANGEROUSLY are the customers who have no regard for the traffic laws (or didn't notice that there isn't a crosswalk in the street) and are parking across the street at the strip mall, taking their lives into their hands, and darting across the busy street. 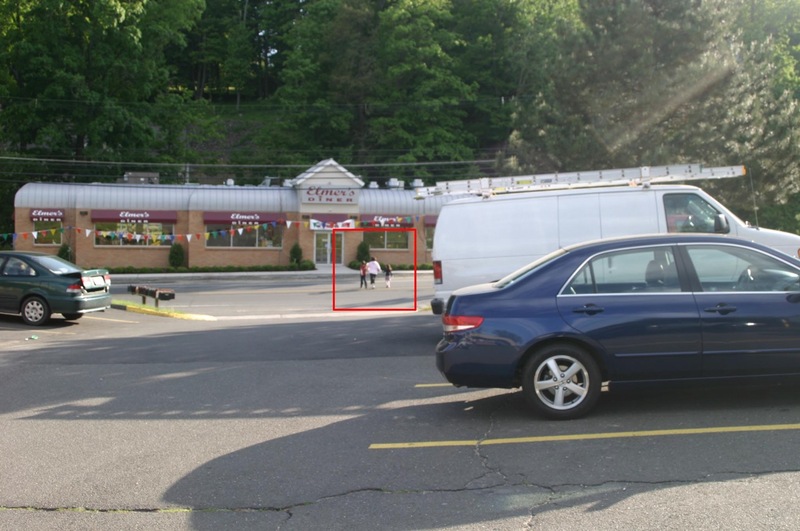 Note the irresponsible parent rushing across the street to the diner WITH HER KIDS IN HER HANDS. Now, again, with the limited parking, the major traffic congestion on this stretch of road, and the parking on the other side of the street, EVERYONE in Danbury knew the exact problems we now face were going to happen. What will it take for Mayor Boughton adn those who are in charge in keeping our roads safe will show some noticeable amount of leadership and get this situation taken care of before someone gets hurt? • Will a MAJOR accident do the trick? • Will someone getting hit by a car to get City Hall to deal with the situation? Unfortunately, the city HAS done nothing about the TRAFFIC DISASTER that everyone knew was coming. According to the News-Times, Mayor Boughton hasn't gotten around to addressing the EASIEST traffic problem that should have been addressed months ago...sending a formal request to the state to post NO PARKING SIGNS IN FRONT OF THE DINER. • AN ELDERLY WOMAN CROSSING THE STREET WITH THE USE OF A WALKER. • A customer leaving the diner in a SUV, after parking on the shoulder of Padanaram Road, and MAKING A U-TURN. • A woman making a ill-advised left hand turn out of the parking lot which could have resulted in an accident. • Customers having problems turning in and out of the diner parking lot due to cars on the street, which are blocking the view of the road. • The sound of brakes locking up on a truck that is driving too fast, which during the winter would certainly hit the set of cars pulling out of the parking lot. 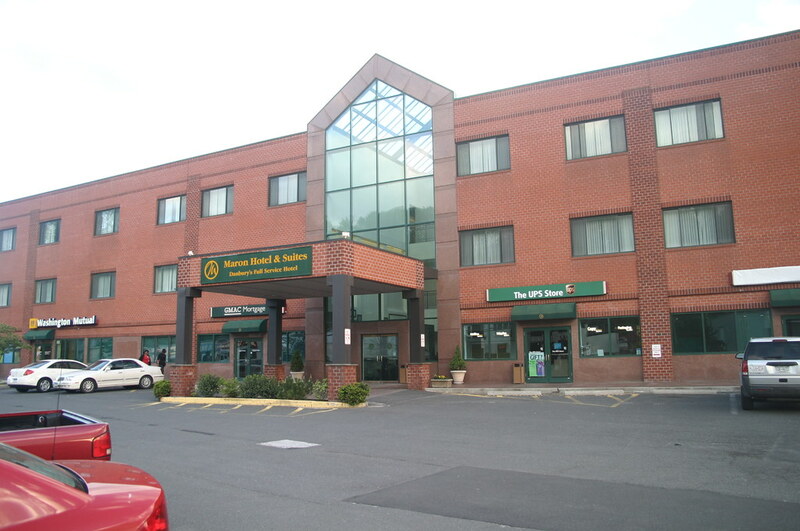 After almost being a victim of an accident while videotaping on the sidewalk, and watching a senior citizen crossing Padanaram Road (using a walker) to a parking spot that was not designated for the diner, and incident after incident of diner customers causing traffic violations, it's my sincere opinion that the current administration has once again failed the residents of Danbury by not taking the necessary steps to keep one of the most heavily trafficked road in the area safe. In other words, this whole traffic situation should not have happened in the first place because the city should have addressed the issue (at the very least). Seeing that the city hasn't requested that the DOT place NO PARKING signs in front of the diner (which would at least solve the problem with cars parking in the shoulder and being in the way of emergency vehicles) speaks volumes about the foresight of this administration. Again the problems stemming from the opening of the diner is NOTHING new to anyone who has been keeping an eye on the construction of the site. 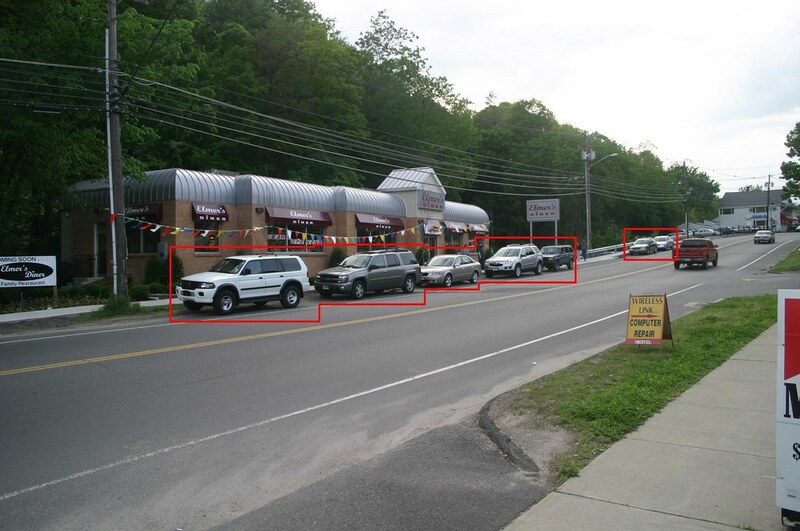 This very blog has commented several times on the traffic conditions in that area of Danbury/New Fairfield going as far as posting a videos of the traffic near the stie of the diner late last year. When the mayor addressed the diner in the media, he felt it better to use the overused political card of placing the blame on the past administration for the conditions in which Elmer's Diner came into existence instead of maybe addressing the matters the diner is creating under his own watch. Again, this portion of the News-Times article speaks volumes about the foresight of this administration. Judd Everhart, a DOT spokesman, said a formal request for [NO PARKING] signs [in front of the diner] from the city had not been filed as of Tuesday. I guess the mayor was too busy playing the role of the immigration czar (here, here, and here), to address real issues in Danbury that people are up in arms about. I guess Mayor Mark didn't get the memo that his immigration well is just about all dried out. Well keep an eye on things and let you know when the first person is hit by a car, someone pulls a stupid traffic move that causes a major accident, when parks on the side of the road, opens a car door and it gets ripped off by a passing car, or any other host of traffic problems that even Stevie Wonder could see happening months ago. for the 2nd district for a second term. 2nd Dist. State Rep. convention, May 20 2008. Photo by CTBlogger. 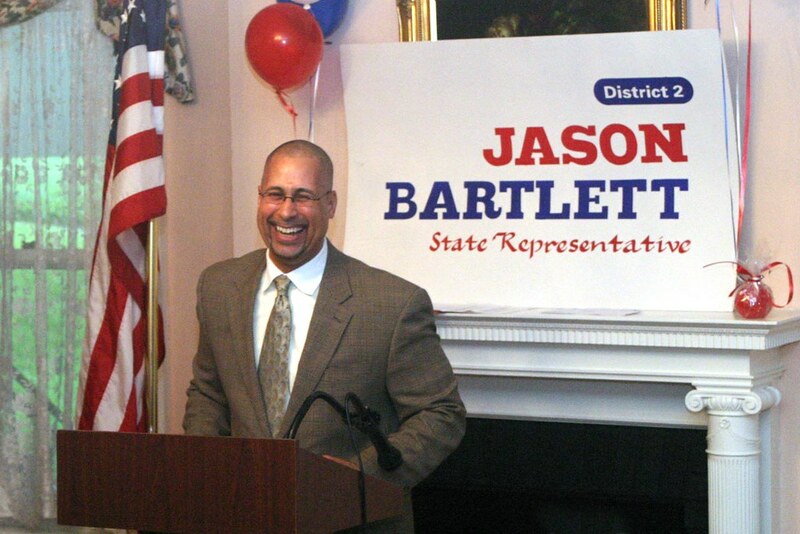 Yesterday, delegates from Bethel, Danbury and Redding that make up the 2nd State Representative District voiced their approval of Jason Bartlett by unanimously nominating him for re-election. Bartlett will now face Republican Melanie O'Brien in the general election. Held at the historic Tarrywile Mansion, the convention was for the most part uneventful as Bartlett nomination was not challenged by anyone but in my attempt to cover all the Democratic nominees in the Danbury area, I decided to videotape the convention and file this report. Well, we're going to find out as the Connecticut Film Festival starts in Danbury. The News-Times is stepping into the UStream world and are doing a live stream from the opening ceremonies. Here's their stream. Well, as you know, it's convention time and the political season is officially underway. In my effort to cover as many races in the Danbury area as possible, here's highlights of the 5th Congressional District Democratic convention. 1. First nomination for Congressman Chris Murphy by 109th State Rep. Joe Taborsak. 2. Acceptance speech by Chris Murphy. 24th State Senate convention. 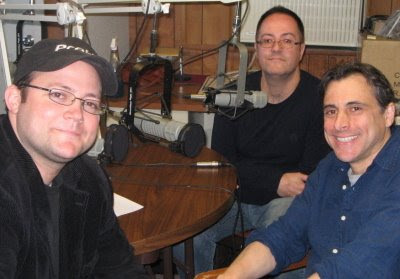 Photo by CTBlogger, May 19 2008. Since the server went down half way through the convention, here's my brief report on what happened. 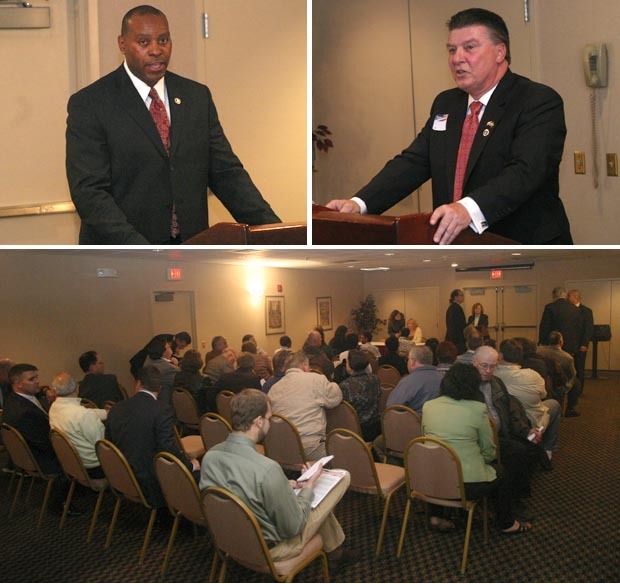 In what should be considered one of the more interesting state senate conventions, although Terry Tierney was just one vote short from forcing a primary, Duane Perkins won the nomination and now faces Republican nominee (and Danbury Mayor Mark Boughton's chief of staff) Mike McLaughlin for the senate seat. Also throwing his hat into the race was publisher of the Immigrant Newspaper, and owner of owner of One Stop Variety, Manuel Bataguas who picked up one vote. Both Perkins and Tierney picked great individuals to present their political resume to the delegates with Perkins being nominated by former Congressman James Maloney and Tierney being nominated by former mayoral candidate Helena Abrantes. And what was a surprising move, after the nominations, a member of the delegation proposed that each of the candidates give a five minute presentation and sell themselves to the delegates before the vote. Asked about his next move, and whether he would try and collect the necessary signatures to trigger a primary, Tierney said he would consider it but what's most important is party unity and taking back the senate seat from the Republicans. From last night, here's footage of the convention (including a brief interview I did with Perkins after the convention was concluded). NOTE: On their website, The News-Times has the following picture of Duane Perkins. Now, I don't have to explain the silliness of this screw-up...right? UPDATE: Attaboy! The News-Times updated the site and corrected the error. From the Maron Hotel, here's the live video feed from the 24th State Senate Democratic Convention. 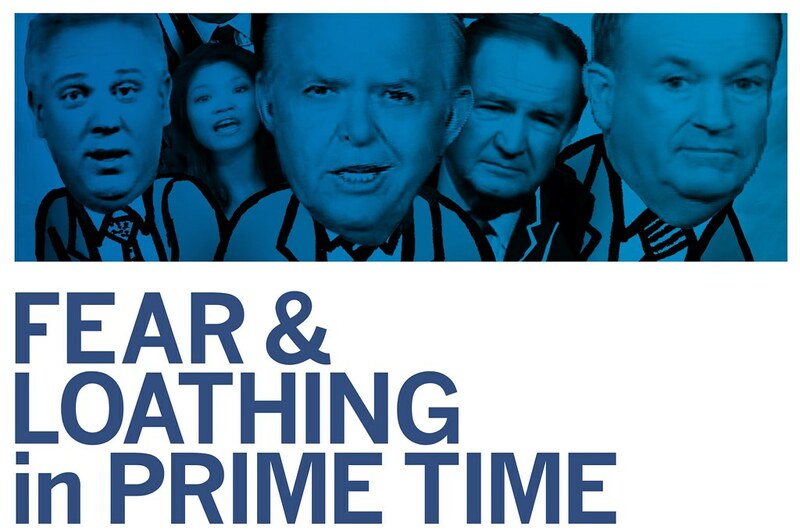 NOTE: Things should get underway around 7:30. UPDATE: Sorry for the technical problems but the stream server crashed. I'm still recording the convention and I'll post the footage later. In a HatCityBLOG exclusive, tonight at 7:00 I will be providing a live video stream from the 24th District State Senate Democratic convention. As of now, three Democrats have their eye on the nomination: Common Councilman Duane Perkins, life-long Democrat Terry Tierney, and former Common Council candidate and publisher of the Immigrant Newspaper, Manuel Bataguas. Now, with all things, doing anything live on the internet has it's glitches but if everything goes as planned, you should be able to see everything that happens at tonight convention which starts tonight at 7 P.M. The live stream testing will start around 6:30. Since I'm feeling a bit better, I decided to give it a try and do one post. Now, for those who are not aware, one of the most important commission in Danbury is meeting RIGHT NOW and are making changes that could have an impact on the way things are done in our city. The charter review commission was established last year to make changes to the city charter (for those who don't know, the city charter is the equivalent to the U.S. Constitution...but on a local level). In time, I'll have an entire section devoted to covering the changes that are currently under consideration but until then, let's go back and look at the ad-hoc committee meeting that established the review commission. From June 2007 (and shown for the first time), here's video footage of the charter review board ad-hoc committee meeting. Again, I'm sorry for the lack of posts but it seems that I'm really sick and I'm planning on seeing my doctor tomorrow. This couldn't have happen at a worse time as I really want to tackle how the mayor screwed up the budget, as well as report on the recent events by the immigrant rights supporters (yes, more happened this weekend besides the church joining the new sanctuary movement). And OF COURSE, lets not forget Andrew Wetmore and everything that happened at the Zoning Commission...oh, I can't wait to get into that situation. Unfortunately, it's very difficult for me to post anything as my head is really killing me and I've spent the majority of this weekend in bed drinking water and popping pills. Even my wife is concerned because she's never seen me like this before so trust me, whatever is going on with me, it's serious so I'm taking a break from the blogging thing until I get better.